Hiking Pico Ruivo from Areeiro (Arieiro) is by far the most challenging and gruelling hike we have ever completed. (I wrote this in 2017 before we’d attempted Volcan Acetenango in Guatemala). Read on if you want to know how we hiked this with our kids who were 13, 7 and 6 years at the time of hiking. 3 When it’s winter time…. 9 Are you prepared for hiking Pico Ruivo? 12 What animal life can you see en route? 13 What’s the path like? 26 Top tips on hiking Pico Ruivo with kids! 27 Leave us a comment? 29 What else can you do Madeira? PR1 – VEREDA DO AREEIRO is the official name of this hike. 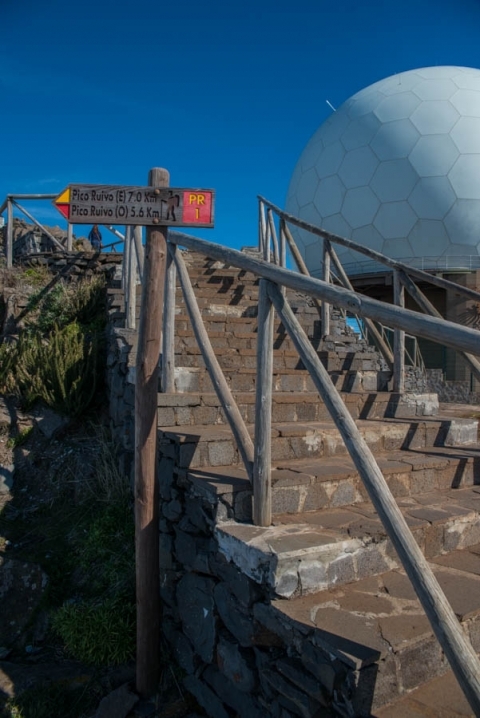 Don’t be deceived by the start height from Areerio of 1818m and the end height at Ruivo of 1862m because around the central peak of Torres, the height drops significantly and you have steps climbing 300m in under a kilometre. The complete walk includes six ascents totalling around 1000m in all. 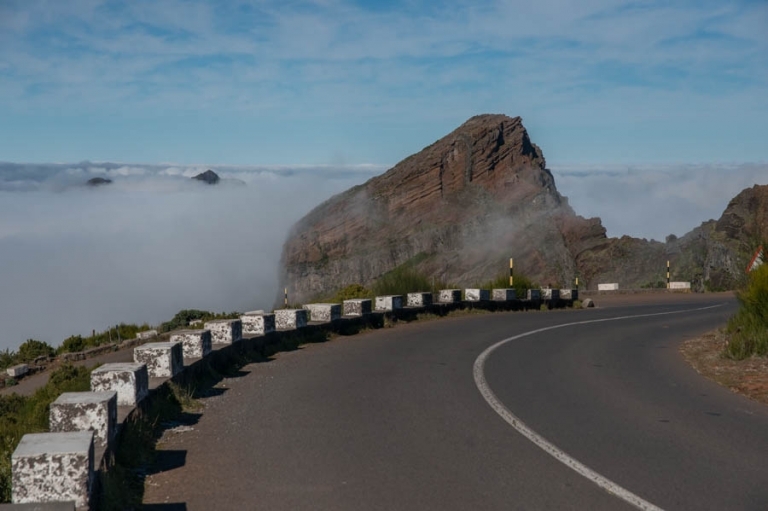 If you’re driving, getting to Pico Areeiro (which is also sometimes spelled Arieiro) is easy and there is a steep road leading up from either Santana or Funchal and there is ample parking in front of the shop-restaurant. My understanding is that there isn’t a bus service up here but that you can get a taxi for under 10 euros from Funcal. There are also quite frequent mini-bus tours for those wanting to take selfies and have guided hikes. We bribed our children, yeh yeh terrible I know, that we’d stop for food or a drink once we’d hiked to Pico Ruivo. So imagine our horror and their faces when we reached Ruivo to find all the buildings closed! In typical Madeiran style there are no notices or anything explaining why or when they’ll re-open. Lesson learned for us! Smack on the wrists and no more ‘positive behavioural reinforcements’ lol. Apparently in summer they only sell water and sandwiches but still, it’s better than nothing! Walking through the archway between the cafe and the tatt shop, you’ll see the ‘Golf Ball’; a NATO radar installation. Once through the building, head to the left and this is where the walk starts. You’ll see the wooden signs. The ‘Golf Ball’ and the wooden signs. As we started hiking the skies were blue, the birds were chirping and the sun was warming my back. It was all pretty idyllic and we were gleeful about this potentially challenging hike. We knew it was going to be a steep hike from the descriptions we’d read and looking down we could see the steepness of the pathway within the first few minutes. The cloud was more than apparent but given the speed it was travelling at we thought it might pass. It didn’t for a very long time. We rounded the corner and descended into the abyss (see photo below)! This might be a slight exaggeration but it does look like something out of a horror movie. The temperature dropped by about 10*c and visibility dropped significantly. I look back at these photos and think how mad we must have been but I’d do it all again tomorrow! It’s a phenomenal hike and I’m really proud that we did it as a family. I have since read blogs recommending this walk only for over 10’s but our 6 and 8 year old managed this wonderfully with not one complaint (except about the lack of cafe at Ruivo)! The view as we descended the peaks walk. 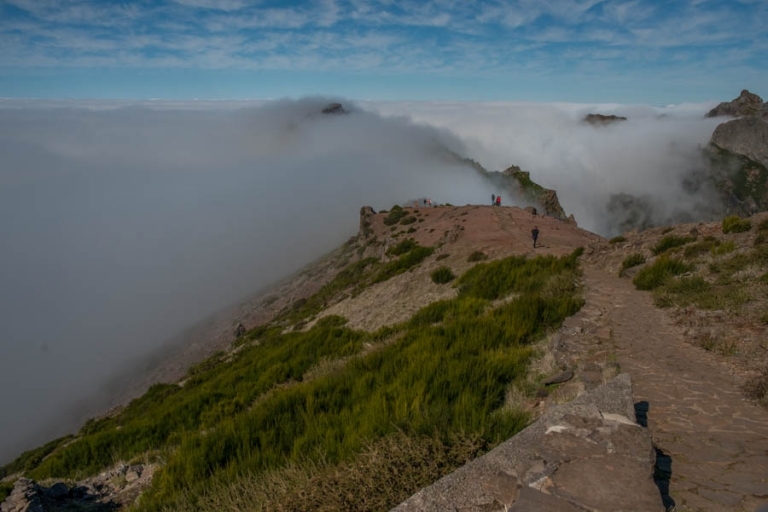 Although this walk links the major peaks of Arieiro and Ruivo, it circumnavigates the second highest peak of Madeira; Pico das Torres (1,853m). Phew, thank goodness we didn’t have to contend with that one too. The two peaks, 4,300ft of ascent are equivalent to Ben Nevis but with extraordinary drops on all sides. Are you prepared for hiking Pico Ruivo? Nothing could have prepared me for the pathways cut into cliff faces, the tunnels carved through towers of rock, the flights of steps cut into sheer crags whilst avoiding the rock slides and fallen wire rails and trying to admire the view as well. Note: 2019 – I’m much more prepared now so if you’re an experienced hiker this will not be too difficult. Paths cut into rock sides with sheer drops. The cloud was immense! It was our plan to walk the eastern route on the way there and the western route on the return however the eastern route was closed due to rock falls. I understand that it is still closed today and I’m not sure if or when it will re-open. That’s not to say that the western route doesn’t have it’s far share of rock falls too and you’ll see this on the route. One of numerous rock falls on the western path. The western route has a number of tunnels and from memory there are about four. They vary in length from a few metres to one which I think is 500m and one even has a bend in it. You’ll need a torch and not to forget a decent pair of sturdy boots and a head for heights! What animal life can you see en route? Flora and fauna on this hike is bountiful. There are plenty of birds and insects to keep you and your little ones occupied not to mention the flowers, mosses and grasses. Birds such as the “Freira da Madeira” (Zino’s Petrel), the “Tentilhão da Madeira” (Madeira Chaffinch), the Bis Bis, the “Melro Preto” (Blackbird), the “Perdiz Comum” (Common Partridge) and the “Pintarroxo Comum” (Common Linnet) have their habitat at Pico Ruivo. Chaffinches are by far the more common bird but we also saw many partridge hopping around in their strange fashion. The path is generally in good condition however there are quite a few areas where the handrail has fallen away and some of the path has eroded. It sounds much more dangerous than it actually is but you will need to have a child who understands the significance of a missing rail. In places there are some small rock falls but these are easily avoided. We encountered a series of seemingly endless steps climbing 300m in a little under 1km. Descending these is obviously easier than ascending them but at least you know what to expect the second time round. Some of the steps are metal, these replace steps cut into the rock that disappeared in a rock slide of 2014, but others are cut into the rock and are wet and slippy. You might need to watch you footing here. ‘What are we doing?’, ‘Why are we doing this? It’s SO COLD!’. The sheer exertion of all those steps is hard work and boy did I sweat! At last, relief comes! 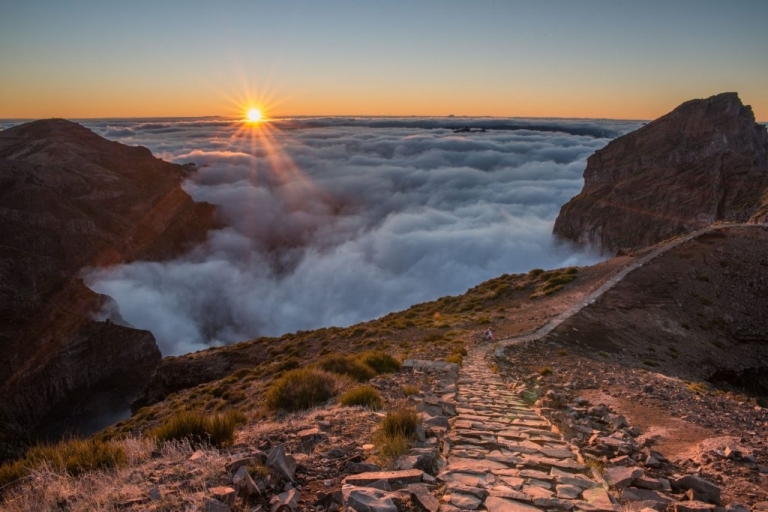 You climb the final step and as you round the corner, Pico Ruivo comes into view for the very first time and boy, is it magnificent!! This was also the first time the cloud had dispersed for us and we caught a glimpse of the blue sky and sun that we’d left behind at Aeeriro. Suddenly, here, it all seemed worth it. The end was in sight – if not quite obtainable. Our very first glimpse of Pico Ruivo and the start of the blue sky. Pico Ruivo is known for it’s variable weather. Even in the summer months the clouds can appear from nowhere. Apparently in the winter it can snow up there too although we didn’t see any snow. Being able to be physically above the clouds and look down upon them was for me a massive highlight of the trip. It is something I have long wanted to do and I was so thrilled to have my camera with me – despite its weight and bulk. It is hard to believe that these photos were taken just 200m apart. After emerging through the clouds, we arrived at an area where all of the trees were white. We guessed at the time there might have been fires there and it seems that there were devastating fires in both 2010 and 2012. This area is recovering albeit slowly and whilst the grasses are a luscious shade of green the contrasting white of the trees gives an eerie feel to the area. Another descent follows the dead zone as views open out onto the valley of the Ribeira Seca. After steadily climbing for a further 1.3km we eventually found a way-marker announcing the summit of Pico Ruivo just 500m away! At this point on the path you can choose whether to descend down to Achada do Teixera (opens in new tab) which is a simple 2.4km hike back to Santana. We did this hike separately because I was so desperate to mount Ruivo’s summit. After what seemed like an eternity, surely not 500m, we arrived at the base of Ruivo and saw the little white buildings. This was really tough on the kids who thought they were at least going to get a drink but at least there was a small toilet still open lol. You’ll need to take your own toilet paper though. We only had 90m left to the summit of Pico Ruivo BUT the light was going fast, visibility was not great and we ran out of time and I couldn’t make it up there. I was GUTTED! Just 90m left and I thought I could run up it quickly but it was steep and twisty and I just didn’t have the energy. It’s my biggest regret that I didn’t make it up and it still pains me to this day! This is definitely NOT a walk you want to do in the dark, so we hurriedly ate our sandwiches and turned back to make our way back to Aeeriro!! I will confess that a little bit of panic started to set in on our way back. It was cold, really cold, and the light was fading fast. We have one member of our team who is exceptionally slow and we had to keep waiting for that person to catch up. A combination of adrenaline, exhaustion and panic made me VERY cold. I actually wish I’d taken a spare top to change into at Ruivo so I was less cold from the sweat. Climbing back through hole in the wall and you can see that visibility is terrible. What a huge sense of relief it was when we saw the Nato radar appear from the clouds, basking in the golden hues of sunset. It’s still about a kilometre from here but we were so thankful to have made it back up before the sun set and we lost the light. I think at this point that lump in my throat gradually disappeared as I realised we weren’t going to be stuck out on the walk in the dark. There was something very deeply moving about that sunset. Maybe because we were physically absolutely exhausted and no words can ever explain how relieved we were to make it back, not only in one piece but before we lost the light. Notes from 2017: I can truly say that this is the most exhilarating, breathtaking and awe-inspiring route I have trodden in my life. It was a phenomenal hike. It sapped all my energy, it drove me to desperation and tears, it made me smile and it united us as a family. You have to try it! One member of our party is VERY slow and whilst we completed it in just over six hours, we could have completed it easily in four and a half. Our younger children didn’t complain once and they loved the walk. Notes from 2019: We’re so much more experienced now and although we’ve done more challenging hikes, this remains a favourite. I used LiveTrekker to map our hike but sadly my phone died three-quarters of the way round. The route is actually 15.5km in total taking into consideration all of the peaks. Top tips on hiking Pico Ruivo with kids! You’ll need a head for heights to complete this. Definitely you’ll need sturdy footwear with a tread and grip. If you have walking poles, they would help. If not, no big problem. Wearing layers of clothes would be advisable. Different length sleeves, definitely a warm outer layer and I would recommend a change of under top when you’re at Ruivo. Start early. Do not leave this hike until 1pm (especially in the winter). You’ll need to prepare all of your food to take with you; we took sandwiches, nuts, dried fruit, energy bars and some grapes. Don’t underestimate how powerful a handful of nuts and raisins can be psychologically. I would also suggest leaving a few bars in the car to come back to. I would suggest a minimum of 1 litre of water per adult and yes I know how heavy this can be. We took 3 litres and left 1 litre in the car to come back to. We almost ran out of water after we’d eaten at Ruivo but left a few gulps. Our kids were 6,7 and 13 years old when they did this hike. There is no reason why a younger child couldn’t complete it although I would suggest a good tether if you’re hiking with a toddler. We saw a family hiking with a baby in a back-pack – just remember how COLD it can get and wrap up warm with hats for young kids. P.S This is no longer the most difficult hike we’ve completed! We took our kids up the infamous volcano in Guatemala, Acetenango and camped at the top for a night! What else can you do Madeira?